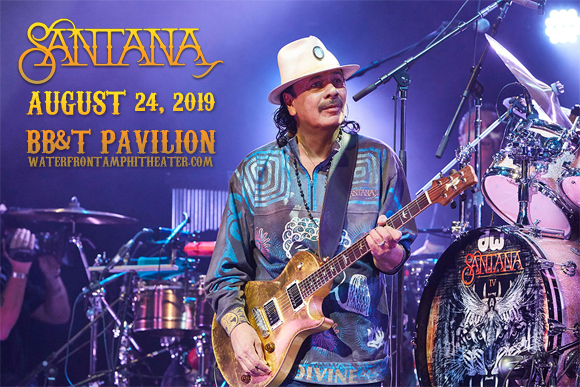 Legendary Latin rock band Santana comes to BB&T Pavilion on Saturday 24th August 2019 on the Supernatural Now Tour! The iconic group celebrates the 50th anniversary of their groundbreaking appearance at Woodstock and the 20th anniversary of their nine-time Grammy Award-winning, three-time Latin Grammy Award-winning album Supernatural, as well as a brand new album set to be released this summer! Joining the group in support will be The Doobie Brothers! Formed in San Francisco, California in 1966 by Mexican-American guitarist Carlos Santana, Santana is an American Latin rock band. The band first came to prominence in 1969 at Woodstock, where their performance of the instrumental "Soul Sacrifice" was widely regarded as one of the highlights of the legendary event. They released their self-titled debut album a few weeks later to widespread success, peaking at Number 4 on the Billboard 200 and Number 26 on the UK Albums Chart. Prolific in both touring and recording, the band continued to build upon its success over the years and, after a seven year hiatus from recording, returned triumphant in 2000 with the album Supernatural, which was certified platinum 15 times by the RIAA and sold 30 million copies worldwide. The album launched two Number One singles ("Smooth", featuring Rob Thomas, and "Maria Maria" ) and peaked at the top spot on the Billboard 200. It also won nine Grammy Awards, including the award for Album of the Year (a tie with Michael Jackson for most Grammy Awards won in one night), and also won three Latin Grammy Awards, including Record of the Year. The group was inducted into the Rock and Roll Hall of Fame in 1998. Their 25th studio album is due for release in Summer 2019.